Seriously? Colored plastic and gold metal? Seriously, that’s what the world has been waiting for from an iPhone? When iOS 6 hit with a massive THUD last year you’d think that Apple would learn its lesson. 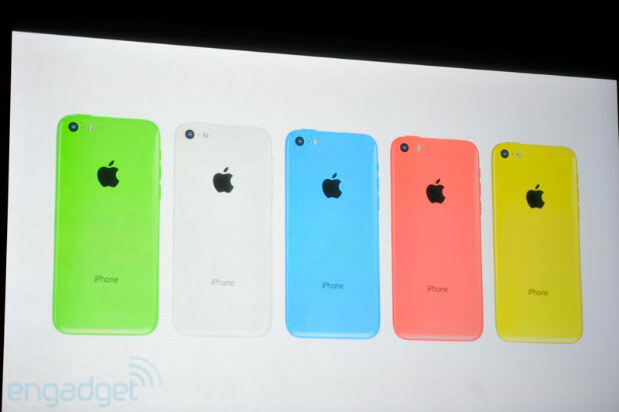 Apparently not, because as Android phones continue to innovate with different sizes and shapes, Apple went with… different colors and plastic. Yeah, I got myself all riled up about this. Sure the new phone, at least the top-end one, is faster. A lot faster, if you believe the charts. And the camera is better of course. But remember when Steve Jobs told everyone that the specs didn’t matter… that the device should just disappear behind the experience? Gee, that’s not the feeling I got when Apple’s new boss started talking about bits and registers and all that stuff. Sure I care about that. But it’s not magic and I guess Apple is flat out of magic. This looks like a make-or-break year for Apple’s leadership and it’s beginning to look like “break” is the way they’re going. There was a real opportunity here to take hold of the smartphone market again. I guess it’s gone now. What was the problem? Did they think that people didn’t want larger phones? Did Samsung already take all the good designs? Or are they just too slow in adapting? We’ll never know. What we do know is that we’re in for another year without a really innovative phone, without a phone that looks as good as it acts. Now, to be fair, there is some good stuff there. There’s faster capture and a better flash, and of now we have fingerprint ID, which apparently is much easier to beat that you think. Great, it’s built into the home button, which means that the home button will be 4x more expensive to replace when it inevitably breaks. Yes, putting the home button on the actual screen is an Android feature, but it’s a good feature, one worth copying. This is probably Apple’s last stand. It will succeed again because the OS is so good, but Apple needs to get cracking because it’s hard to imagine that people will continue to put up with the same boring design over and over if they have a choice (and they do.) With these phones they’re just catering to the low-end, the tech stragglers and the deliberately unhip. Even though I count myself in that group (especially the last part about being unhip) I wanted so, so much more and I didn’t get it. So, so disappointed. I was so, so hoping that the leaks weren’t “all there is.” How many more times will we have to do this soul-crushing dance before we get a really new device? When will the average person get 5G?